Cover Reads: Jake And Mom Watched Dad As He Tried To Rewind The Dvd He Got For Christmas! Inside Reads: For A Merry Christmas Just Push Play. 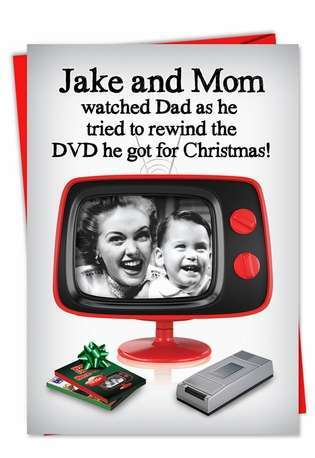 There's nothing like 'Old School Humor' to send your Holiday greeting. You can be sure this high-quality card by NobleWorks will be received with joy and laughter just as it was meant. 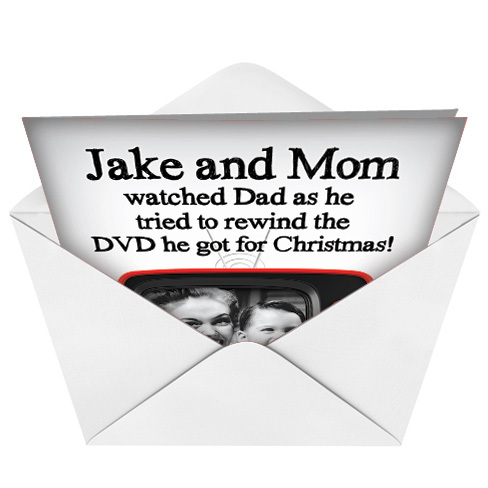 Everyone can picture dad trying to rewind his new DVD from this low-cost card made from recycle materials right here in the U.S.